And she was a bald toddler. The first time she ever wrote her name we were living in a remote village in Guyana. 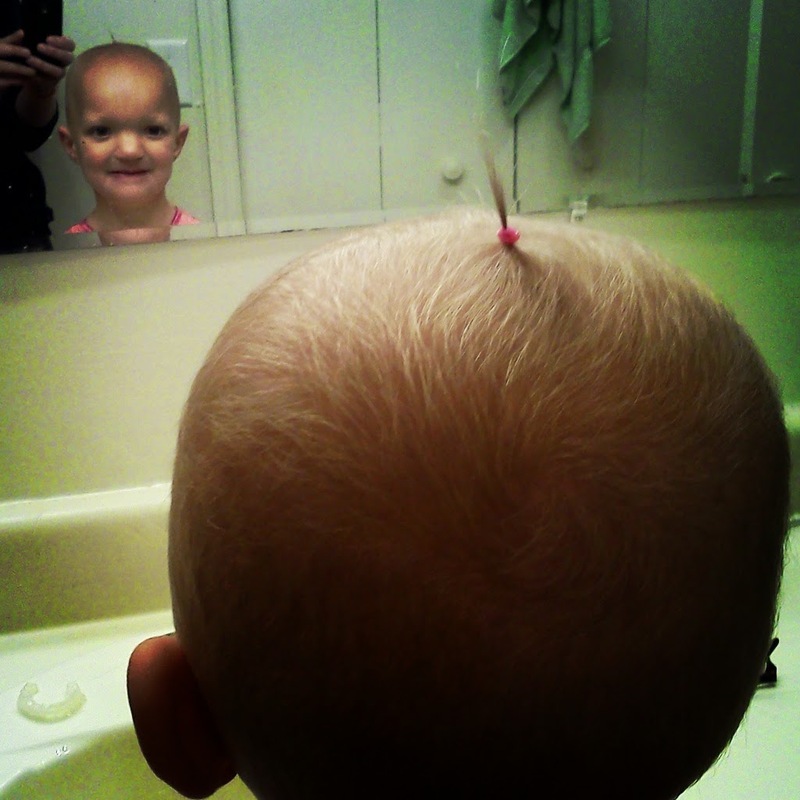 She was 3 and still bald. Last summer we visited family. She was 4, and still bald. Today I stumbled upon this article. Stop reading my blog right now and read that one. No really, go read it. 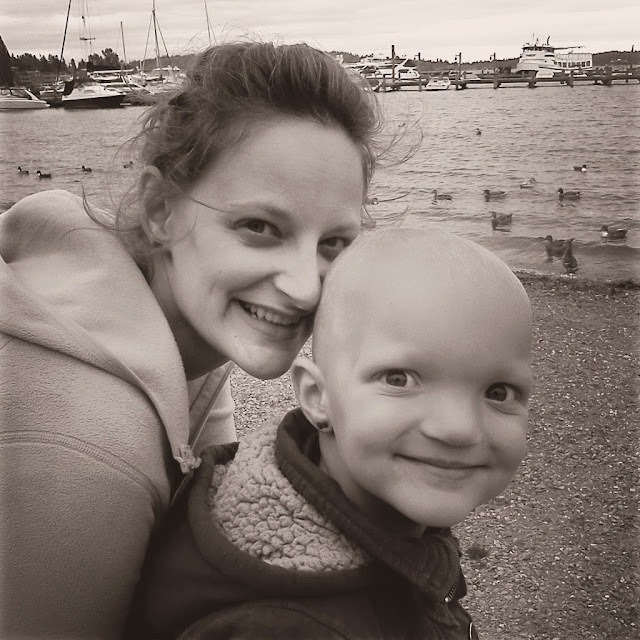 I have shared some of our experiences with our daughter looking like a chemo patient (yes, I'm aware of the resemblance). From the time she was born until... last Thursday... people have noticed she doesn't have any hair. When she was 2, almost 3, a man came up to me at a playground, gushing on and on about his experience with his daughter fighting cancer. I tried to interject, "She is healthy..." several times to which he replied, "Good, good, keep on fighting!" Finally I was at a complete loss, and he was near tears. I didn't know what the right thing to say was. "She doesn't have cancer. It's genetic." I'll never forget the sheer embarrassment that crossed his face. It was really awkward. "Thank you so much, though, for sharing your story. I'm so honored that you would share with me. It's very touching..."
A couple of months ago I was shopping in a supermarket. I noticed an older gentleman watching us. My kids have a lot of energy and were probably pretending to be cats or something, so I didn't think too much about it until I realized he was not just watching us - he was following us. Finally I came to the end of an isle and he came around the other side. "Excuse me" His voice cracked as he motioned for me to come over to him. Other shoppers watched, I silently prayed they'd stick around... just in case... I took a few steps apprehensively. "I just... I..." The man reached into his pocket and pulled out his wallet. "I don't have have much money, but I... I just..." His eyes met mine for the first time and there were tears in his. "I just want to help you out. Can I buy your groceries today?" He wiped a tear and looked at Millie, who shyly hid behind me. Bless his heart. He just wanted to help out a mom with a kid with cancer. Even family members have asked if I've taken her in for a second opinion. Have we seen a specialist? Are we going to get her a wig? Do they know what's wrong with her? Here is what is "wrong" with Millie: Nothing. Not one thing. Did you read that article I linked? If not having any hair is our biggest problem, we're doing pretty good. I can hardly imagine actually having a kid with cancer. Not knowing how long you have them to hold (not that any of us really know), not knowing if treatment will be successful, not knowing if you will be able to hold on much longer. Sob. I can't even. My daughter won the genetic lottery of not bing able to grow hair very well. Her daddy, and his mom, had the same struggle in their early lives. They both have thick curly hair now. I'm not worried. Doctors aren't worried. She will get hair. 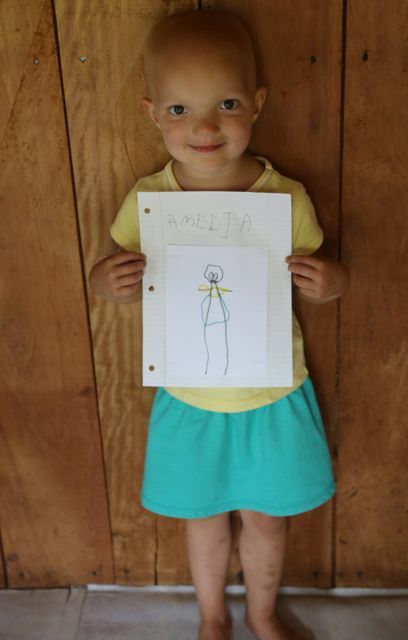 Because my dear Millie is the sweetest, most compassionate, generous little 5-year old I've ever met. She has the most beautiful, gentle heart. She loves animals, has the best imagination, and the brightest future. Hair just isn't really all that important when you've got all that. All I can say is that you have a beautiful daughter. I bet she is bubbly, friendly and kind, qualities which go far far deeper than looks. I agree, everyone is different, the world would be a boring place if we were all the same. So what if she was bald for the first 4 years of her life? She still looks beautiful and healthy and as the photo of her as a toddler, she looks so sweet just running around, playing, being happy and doing what other toddlers do and with a bald head which in my opinion brings out the cuteness in her. I think people can be judgmental when they don't realize it but I'll tell you this, you have an angel there for a daughter who will grow up into such a wonderful and caring person and along the way I believe she will give you so much love and joy than you can ever imagine.